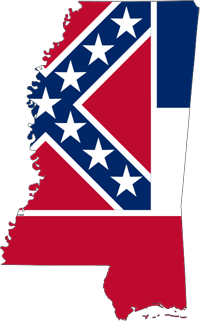 Cheap Mississippi auto insurance quotes, companies, laws, minimum requirements. We help to find cheap auto insurance in Mississippi. Are you looking for a better policy? You’re in luck, as we have one of the most effective tools available. Our free quote tool is responsible for some of the best cheap auto insurance policies in Mississippi. Since our inception, we’ve only wanted to help people find something that they can afford. If you’re thinking about changing policies – it can all start with quotes from us! The state of Mississippi is a Tort state. This means that if the state declares an individual as the cause of an accident, the named person will be required to pay all the damages which result from the accident they caused. This will include all medical bills and vehicle repairs. For this reason, insurance companies may encourage you to purchase more than the minimum auto liability insurance required by the state of Mississippi. If a car is financed, you will most likely be required to carry comprehensive and collision coverage on the vehicle. Insurance companies in Mississippi do not have to cover members of your household if they are not listed on the policy and in fact the insurance company can choose to exclude household members for legal reasons. These exclusions are legal and will be listed in the exclusions section of your policy with all the other conditions which will allow your insurance company to refuse a claim. Even though you do not have to list everyone on the policy, the company may request it. If you do not comply with the company’s request, they can deny the claims on any persons not included on the policy. In the state of Mississippi, the insurance company is allowed to check out your personal credit history when offering you insurance and setting your premium rates. They will also look at your driving record, age, gender, marital status, age and condition of the vehicle being insured, and the area where you live as well as the type of vehicle you drive and how far you drive each day. Maintaining a good driving record and paying your bills on time may help to reduce your premiums. There are other additional ways to find cheap Mississippi auto insurance. Safety devices such as anti-lock brakes side air bags, automatic seat belts and daytime running lights may also reduce your premiums along with anti theft devices like an alarm system and global positioning systems. Parking your car in a garage or secured area is another way to reduce your premiums. Where you live will affect your insurance rates which can be affected by weather extremes, high theft risk, and high traffic patterns. Don’t forget to maintain a good credit record as the insurance company looks at this to determine how likely you are to pay your premiums on time, failure to do so may put you out of the running for finding cheap auto insurance in Mississippi. Prior accident claims will also be a red flag to insurance companies especially if there are several claims on your past record. The amount of your deductible is also a key factor when determining insurance rates. The higher your deductible is, the lower your insurance rates will be. In all, it’s all about being a safe and reliable driver to obtain cheap auto insurance in Mississippi. But even if a person has a few black marks on their record, there’s still a good chance for you to find some better rates. Our quote tool has connected many people with an auto insurance policy that they’re pretty excited about. If you feel as if you should pay less for your policy, try our tool!